Bob Hollister has renewed our Not For Profit papers with the state, so the law will not be knocking at our door. The next tour event will be on Sunday, May 20th with the annual Shakedown Tour at Indian Lake. Sunday June 10th is the 50th Anniversary of the Lima Ford plant from Noon to 5 PM. Details will be given at the June meeting for those who want to attend. Friday, June 15th is the Bluffton Festival of Wheels Cruise In. The cruise in begins at 5 PM on Main Street. For those who want to attend, it is wise to get there early for a good parking spot. More details at the June meeting. 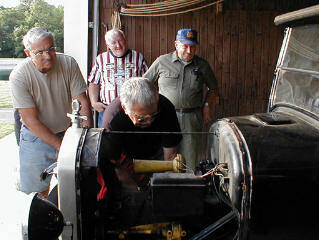 Rodney LaFollette, a long time member of the Northwest Ohio Model T Club died May 21, 2007. His spouse, Marge survives. If you wish to send a card, her address may be obtained at the meeting or by calling Jack or Jim. A card has been sent on behalf of our group by Bob Torbet. The Family has requested that no flowers be sent. I believe that's Rodney in the striped shirt. We were trying to figure out why Bob Hollister's roadster kept running out of power. Saturday, June 9th from 10 AM - 1:30 PM - Show and Tell at Mennonite Memorial Home in Bluffton. We will crise for ice cream afterwards. We can buy lunch at the home if you are interested, but Jack needs a head count before hand. They want reservations if you want to eat lunch at the home. Sunday, June 10th from Noon - 4PM - Ford Motor, Lima plant 50th anniversary static display. This is a FORD only display. (wonder why?) Youw will be able to tour the Ford Motor Company engine assembly plant. The new assembly line is mostly computer controlled and uses fewer workers. I am told in the event of bad weather we will be moved inside. 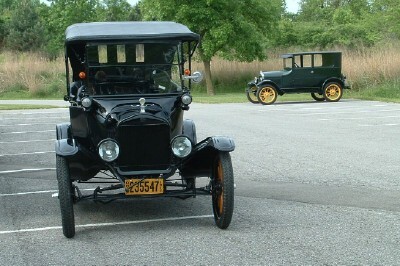 Friday, June 15th 5PM to Dark - Cruise in at Bluffton, Park on Main Street. Best to be in line by 3:30 - 4:00. Always a crowd pleasing event. $7 pre-registration, $9 that evening. Lots of door prizes. Free drive in movie at 9:30. Paraded at 8:30 if you want to participate. We started to assemble at the state park on the northwest corner of the lake at around 9:30. 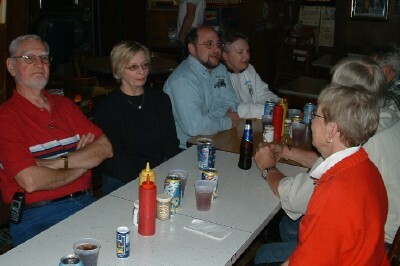 Those in attendance were Dave Benny, Bob and Ann Torbet, Jack and Marilyn Putnam, Bob and Pat Hollister, and Jim and Sue Cook. We had a great trip around the lake and saw some great stuff in the process. 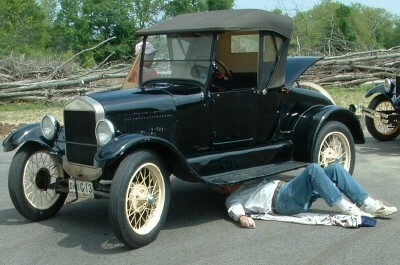 Bob Hollister just could not resist the urge to climb under his car to tinker with the electrical system. Hey, it was a shakedown tour!!! Next month's photos will show the real thrills of this particular stop. You just can't have a tour through a covered bridge without someone taking a few pictures. 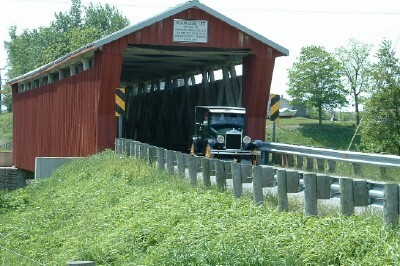 This one shows Jim and Sue exiting the covered bridge on the southeast corner of the Indian Lake. A trip to Indian Lake is not complete without lunch at the Titlton Hilton. (see last year's tour pictures for an outside shot). The level of Pat's tea gives you some idea of the slope of the table.